Waters of Mars is good. It is the best of the Specials so far. It balances an excellent base under siege story, which would have fitted rather nicely into the Troughton era, with the darker story of the Tenth Doctor's impending death and the whole idea of the Time Lord Victorious. It helps that it is directed by Graeme Harper who is one of the best directors of Doctor Who there has ever been. He certainly knows how to pace a story. Add to that a slightly mysterious water-based enemy - which the Doctor refers to as The Flood, which is implacable, indestructible and patient. As the Doctor himself says "Water always wins". Plus, the human-Flood creature is wonderfully realised and genuinely rather creepy. Oddly the cracked mouths reminded me of the Ice Warriors, which might just be me. Of course, the Martian location makes that kind of thinking unsurprising. It certainly looks great. Even the quarry looks like how Mars looks from the pictures we've seen so far. Bowie base nestles nicely in its valley. They've also made the base look as realistic as possible. You could picture Bowie base being built now. That additional realism adds to the strength of the story. The slight quibbled exception being the 'Gadget' sequences when the Doctor soups it up. They just seem a little silly in a story that is distinctly short on silliness, but then perhaps that's part of the point. 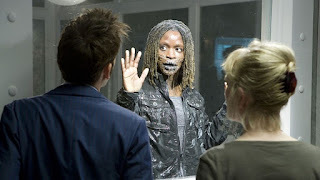 It has an excellent performance from David Tennant as the Tenth Doctor struggles with the desire to interfere, his knowledge of the fate that awaits the crew of Bowie base, his awareness of the Laws of Time and then his desire to save someone, even though he knows that sometimes - like in The Fires of Pompeii he sometimes causes what he is seeking to prevent. 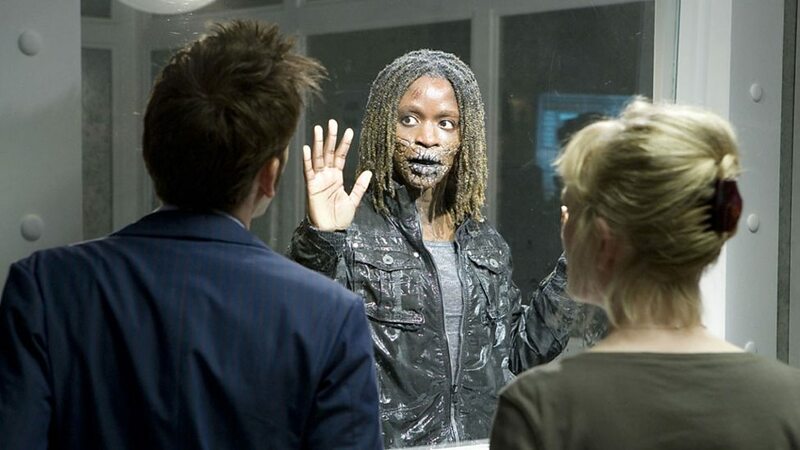 Then when he cracks, and the Doctor becomes this Time Lord Victorious, Tennant really excels himself. It's as if all the death, all his guilt and all the pain that the Doctor has experienced fuses with the awareness of his impending death to give The Doctor a nervous breakdown. And, as at a lot of points in The Doctor's history, it takes the actions of a human being to snap him back. That person is Captain Adelaide Brooke (the quite brilliant Lindsay Duncan). This is the Doctor as close to The Master as he has ever been. The history of the programme seems to imply that approaching mortality drives Time Lords mad plus it is reminder that the Doctor shouldn't travel alone as it pushes him away from humanity into Time Lord. It’s dark and rather wonderful. We see what he COULD be. He's contemptuous of humans, arrogant and lost. Raging against the dying of the light. So, watch this. It's good. And I haven't even touched upon the excellent performances from the minor parts in this story. People who get minimal screen time but who we care about. For example, Steffi Ehrlich's 'death' is genuinely moving for which Cosima Shaw deserves some applause.